Pixar is famous for its brave storytellers and there is a reason why the studio has churned out an unbroken chain of unforgettable films over the last 20 years. The studio’s latest and most ambitious movie to date, Inside Out, is an absolute delight – funny and smart, fast-moving and full of surprises. It’s about 11-year-old Riley, who has just moved with her parents from Minnesota to San Francisco. But it’s Riley’s inner consciousness that is the heart of the film. We see her five emotional forces as the characters Joy, Sadness, Anger, Disgust and Fear as they push buttons and twist knobs and help power Riley every day, creating multicoloured marbles that contain memories. Most marbles are warehoused daily in the long-term memory storage but a handful stay, becoming her core memories. The pillars that Riley’s life is built on, such as friendship, hockey and family, have spawned whole islands of identity powered by her memories. When these pillars start to crumble with Sadness and Joy ejected into Riley’s darkest mental universe, the real action begins. The movie revolves around this mismatched pairing forced to travel through Long Term Memory, Abstract Thought, and Dream Production all while hooking up with Riley’s part-elephant imaginary friend, Bing Bong. As they struggle back to the control room, the fantasy creations and imagination depicting the inner workings of the mind and heart are simply mind-blowing. 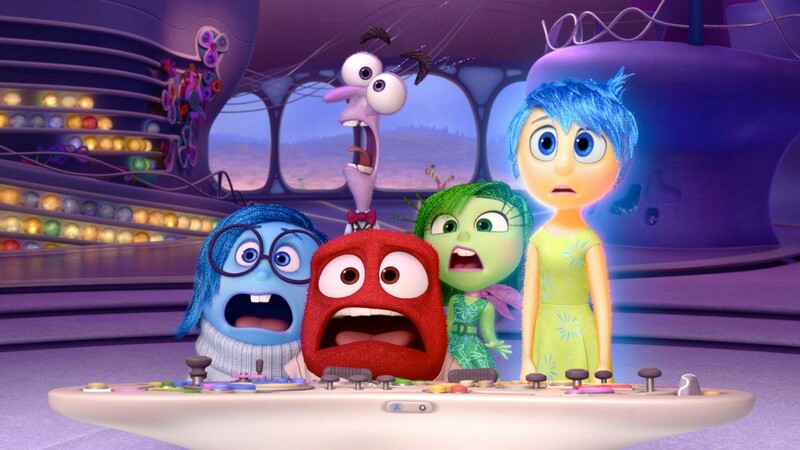 What Inside Out has managed to achieve is the mental universe created inside an 11-year-old’s head – populated by abstract concepts and shifting sensations moving through theoretical space, ultimately a world profoundly new but at the same time recognizable, as familiar aspects of consciousness are given shape and voice. It is a world like you’ve never seen before, filled with an outburst of colours, riot, wit and vibrancy that ranks among Pixar’s grandest visual triumphs. What’s great here are also the characters developed to carry the storytelling forward, to make sure the characters themselves remains relatable and relevant to Riley’s life. Joy is the fairy-tale epitome of bubbly, positive and happy. Even without a proper organizational chart, Joy evidently plays the role of boss in the team. Anger, a red chunky-like cushion is fiery, impatient and quick to overreact to life’s imperfections. He’s known to get fiercely passionate about enforcing fairness so your order of broccoli on pizza is nonexistent. Disgust, the green sass, is highly opinionated and extremely honest. Whether its broccoli or last year’s fashion trend, she keeps a close eye on what or whom Riley encounters in her life. Fear is a spineless creature known to excessively feel terror, horror and panic. However, he is a guardian angel in disguise always looking out for potential danger, harm and risk in Riley’s daily routines. Last but not least, Sadness is blue and slow-moving. She’s often referred to as the spoilsport but proves herself a worthy hero like Joy. She allows Riley to grieve over her new change in life and, eventually, move on and change for the better. By the time Inside Out ends, the message of the movie remains clear – we are supposed to face life and embrace every emotion that comes along with it, even if its sadness, anger or fear that we feel. No emotion is superior to the other because after all all these tingling emotions can be a spur for a more worthwhile joy in the time to come, making even the simplest or the toughest parts of life an endless journey of adventure. Tags: anger, animation, blockbuster, disgust, disney, disney pixar, emotions, ETC., etctaylors, fear, film, Film Review, inside out, joy, pixar, sadness, Taylor's University Lakeside Campus, Taylors, TULC. Bookmark the permalink. It was hard to find this post in google, but i’m glad i found your awsome site.